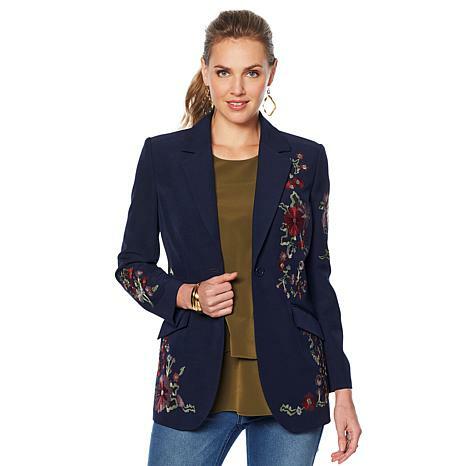 Floral embroidery jazzes up the tailored look of this gabardine blazer, adding a trend-right touch to set it apart. Perfect for office-to-dinner dressing and for and special events. Fit great. Embroidery was tight and good to touch, pretty design. Blue was so dark could almost pass for black so good for fall and winter. Sale pricing made me try. Love the jacket. So many compliments.The fit is awesome.curves in all the right places.Size ordered medium. Perfect fit.bought it on sale. great buy. Absolutely beautiful! As soon as I received it I ordered another one in adoffent color! I recrive many compliments on it. The cut, fit and fabric are wonderful ! Beautiful quality! Diane Gilman started her career designing for some of the world's biggest rock 'n' roll stars. Decades later, she has earned the title of "HSN's Jean Queen" with legions of dedicated fans. DG2 by Diane Gilman features chic separates and accessories to enliven a classic wardrobe. Her versatile collections are anchored in denim, with multiple fabrications to suit every taste, shape and style. She's constantly updating popular silhouettes with solution technology, trend-right color, unique finishes, embellishments and exclusive prints, keeping the emphasis on comfort and fit — because every woman deserves a flattering wardrobe to complement her dynamic life. Remind me about Diane Gilman upcoming shows. 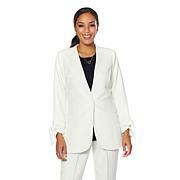 For a comfortably-stylish alternative to denim, this lightweight blazer is ideal. The flattering silhouette is perfect for all body types. 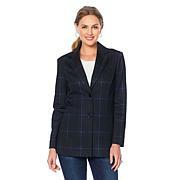 The contemporary design adds a modern update to the classic boyfriend blazer. It's feminine, fierce and fit for a fashionista. Find warmth in a blazer this season. This is the perfect transitional piece, giving you range to layer lighter weight pieces during warmer days. Add chunky-knit scarves and more for colder-weather weeks too.